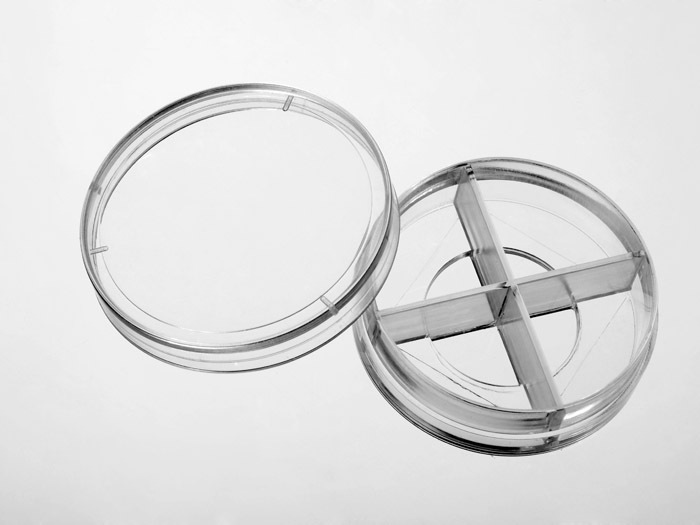 A 4 Chamber 35mm glass bottom dish has the same size as a 35mm glass bottom dish. However the dish is divided into 4 chambers that quadruples sample size. Note: We found that a small percentage of microscope adapters are too small for our 35 mm glass bottom dishes. Please check carefully the dimension of the dishes in product detail page. If your adapter is too small, you should use our 29mm glass bottom dish instead. Quote: "LSR II and analyzed using Flowjo, v10.7. TMRE staining Cells (AN3CA, JHUEM2) were plated onto glass-bottom dishes (Cellvis 4-Chamber 35mm Glass Bottom Dish with 20 mm microwell, #1.5 cover glass, D35C4-20-1.5-N) or #1.5 coverslips"
Quote: "Cells expressing H2B-GFP were plated in four-chamber glass-bottomed 35-mm dishes (Cellvis) coated with Poly-D-lysine, and filmed in a climate-controlled and humidified environment"
Quote: "The images were processed in LAS X Leica Microsystems software packages. The cells were seeded into 4-chamber 35 mm glass bottom petri dishes (Cellvis, Mountain View, USA) and incubated overnight allowing them to attach to the glass bottom of the petri dish"
Quote: "Time-lapse recording for SRB assay.HeLa cells were seeded in a four-chamber, no. 1.5 glass-bottom dish (Cellvis) and cultured overnight before being transfected for 36 h with pET018." Quote: "HepG2 cells were cultured on 4 chamber glass bottom dishes (In vitro Scientific, Sunnyvale, CA) overnight prior to addition of compounds, and then treated either with 0.1% DMSO or GE (100 μM) for 24 h"
View all 42 publications citing "4 Chamber glass bottom dishes"